I was lucky to find myself living in close proximity to one of the few protected areas in Beijing when I first moved here in 2010; the Dongsi 东四 area in Dongcheng district. The 14 hutongs (traditional Beijing alleyways) in this area are under a high level of preservation protection thanks to some innovative courtyard restoration projects that started in the 90s. Of particular relevance to this area and its cause are the Red Capital projects by Laurence Brahm. A political-economist, international mediator and global activist, Laurence is widely known for his accomplished work as an economic advisor – drafting the overarching financial reforms and accompanying policy legislation that led to economic take-off for both Vietnam and Laos – and as a member of former Premier Zhu Rongji’s economic advisors – helping pave the way for China’s entry into the WTO in 2001. I however, know Laurence best as the first person to restore a traditional Beijing courtyard and turn it into a private hotel. A few weeks ago I had the privilege of meeting with Laurence and picking his brain on the rather unique case of the Dongsi area and how it all started. The Dongsi area is a comparatively small residential area just north-east of the Forbidden City within Dongcheng district. 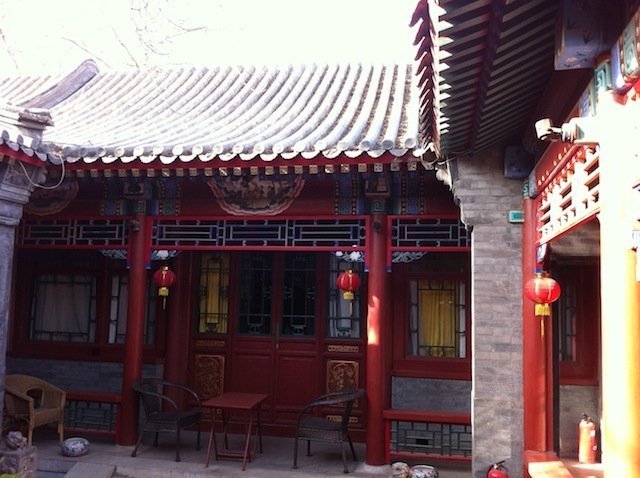 It dates back to the Yuan Dynasty (1279-1368) which was founded by the Mongol Emperor Kublai Kahn and to whom old Beijing owes its hutong style urban planning. Before the Communist Party took control of China in 1949, the Dongcheng area housed most of Beijing’s elite and wealthy-merchant class. The “systematic tear-down” of old Beijing started in the 1990s with the destruction of Wangfujing 王府井, which is located just east of the Forbidden City. 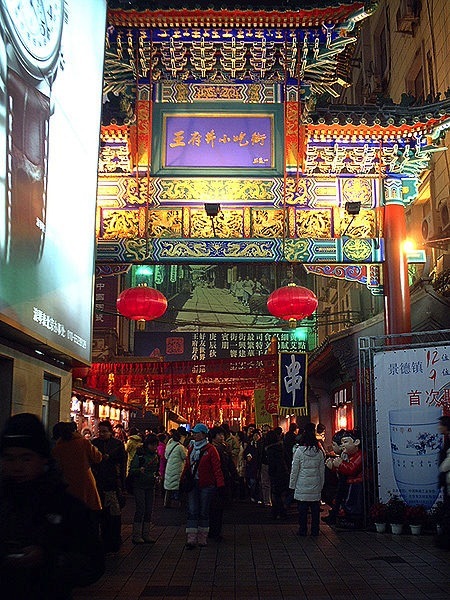 The hutongs were destroyed to make way for the Oriental Plaza, and now sadly Wangfujing is best known as a commercialised shopping area with an eccentric “food street”, as opposed to one of the most historic streets in Beijing. During the Yuan, Ming and Qing Dynasties Wangfujing represented one of the richest and most important residential areas of the city; the area where the homes of the imperial princes was located – “wangfu” literally meaning princes mansion. Thanks to Laurence and some forward thinking local councilmen the Dongsi area managed to escape Wangfujing’s fate. 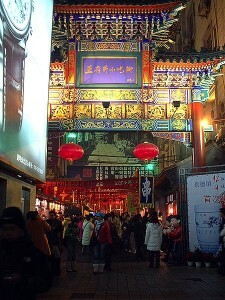 Laurence Brahm used to live in a traditional courtyard in the Dongsi area when he was working as a lawyer in the 1990s. 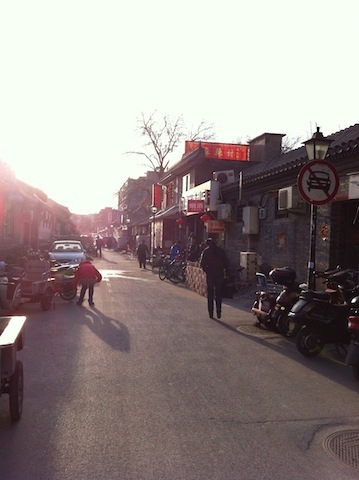 At the end of the day he would cycle from his office in Guomao, southeast of the Forbidden City, back to his courtyard, soaking up the local hutong atmosphere as he neared his home. When the government first began the “systematic” destruction of the hutong areas, Laurence felt something had to be done to protect them. Instead of direct protest – which he had witnessed firsthand and decided would be ineffective – Laurence took a different approach. He wanted to create an example, a success story which would make other people in the area want to follow his lead. Having decided to restore a courtyard, it still took Laurence a while to convince the local planners of his idea. Eventually he was granted the government permit (one of probably only a handful ever given out to foreigners) to buy a courtyard and found a property on Dongsi batiao 东四八条, (the 8th street) in need of repair. 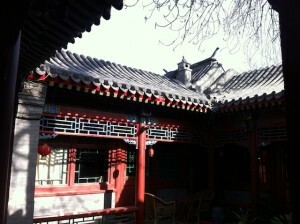 The courtyard was restored to the traditional Beijing style and the facades decorated in the bright red, blue and green colours typically associated with imperial Beijing architecture – indeed, for his later projects Laurence employed a painter who also did decorating and artwork for the Summer Palace. 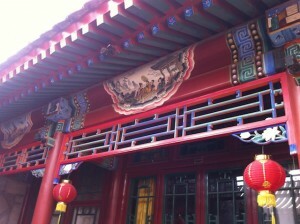 The interiors were decorated in a confluence of Ming, Qing and Mao era decorations and furniture. This first project became his home and studio, and was the prototype for the Red Capital brand. As this was the first restored courtyard of it’s kind, it soon became a gathering point for an eclectic mix of people. 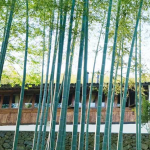 Whether it was the famous pop singer Ai Jing who wanted to do a photo shoot, the Chairman of Chubb asking to host a company dinner, or even couples asking to hold their wedding ceremony there, everyone was enchanted by this little courtyard. 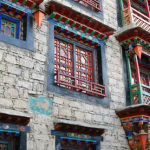 It took Laurence another year to restore his second courtyard, working with a restoration team who also did work restoring buildings in the Forbidden City. 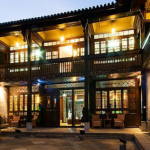 Red Capital Club opened in 1999 and as the first restored courtyard restaurant in Beijing it became an immediate hit. Government officials started to drop by to see what all the fuss was about and Laurence would take those opportunities to continue their ongoing debates on protecting the courtyards. It was a completely new concept to preserve something that was old and did not seem to have any value or purpose. However, having won the Conde Nast award in 2000 for one of the ‘Top 60 Restaurants in the World’, (something none of the Beijing 5 start hotel restaurants was able to achieve) the Club demonstrated exactly the opposite. There are 25 protected zones in Beijing. However these zones are not evenly divided around the city. For example, Jingshan Park (directly above the Forbidden City) holds 4 zones, streets to the east and south of the old city centre each hold one zone, with Houhai park, Xisi, Dongsi and Qianmen making up the rest. 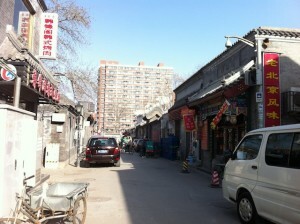 So in reality there are only a few areas in Beijing actually under heritage protection. Added to which, there are no uniform policies on how to go about protecting these zones, resulting in various local councils from different districts all with their own agendas on what protection means and how to go about it. One example of this loose interpretation and application to “heritage protection” is demonstrated with Qianmen. The third property Laurence opened was the Red Capital Residence – the first private courtyard hotel in Beijing. Obtaining a hotel license was one of the biggest issues for this project, as there were no precedents for licenses given for only 5 rooms. The Red Capital Club and Residence set examples of what could be achieved by protecting and restoring old courtyards. Today there are over 300 courtyard hotels, and no shortage of courtyard restaurants, dotted around Beijing. By restoring three courtyards within close proximity of one another in a protected zone, Laurence effectively put a footprint on each of the three alley ways, further reinforcing the protection to that area. Neighbours and locals began to see the success of these restoration projects and to take on similar projects themselves. On dongsi jiutiao alone, where the Residence is located, there are at least 2 other private clubs and 4 boutique hotels, with more work underway. Laurence welcomes this type of competition. It is the very process he was advocating for, a process he dubbed ‘the natural evolution of a community’. This successful model laid out by Laurence created a quandary for the local council. As other courtyard owners started to copy Red Capital’s lead, helping naturally evolve their neighbourhood, it became less appealing to sell off land to developers. Not only would a prospective developer have to work around all the existing protected buildings, they would also have to compete with a whole bunch of new businesses that were firmly integrated into the community. When Wang Qishan was elected mayor of Beijing in 2004, where he served until 2007, there seemed to be some clarity and forward thinking and the Dongsi area was placed under full heritage protection by the Renda 人大 (National People’s Congress). Hopefully for the Dongsi area this will not be it’s fate. The historical protection afforded to it by the The People’s Congress is the highest available. This special classification has thus allowed for this community to, at least for the time being, evolve naturally- preserving its unique heritage while simultaneously adapting to the modernity that has enveloped the city of Beijing.